We’d love your help. 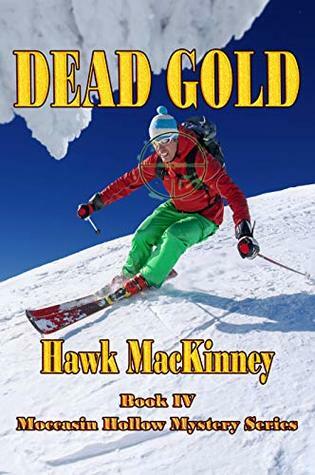 Let us know what’s wrong with this preview of Dead Gold by Hawk MacKinney. To ask other readers questions about Dead Gold, please sign up. Dead Gold is the fourth installment from the Moccasin Hollow Mystery series. It is the first book I have read by Hawk MacKinney. Even though it is the fourth book in the series, I felt it could be read as a stand alone. At least, I did not feel as though I was missing anything or lost by not reading the other books. I enjoyed this story. It was full of adventure, action, mystery and suspense. I give Dead Gold four stars. I would love to go back and catch up with the others in the Moccasin Hollow Dead Gold is the fourth installment from the Moccasin Hollow Mystery series. It is the first book I have read by Hawk MacKinney. Even though it is the fourth book in the series, I felt it could be read as a stand alone. At least, I did not feel as though I was missing anything or lost by not reading the other books. I enjoyed this story. It was full of adventure, action, mystery and suspense. I give Dead Gold four stars. I would love to go back and catch up with the others in the Moccasin Hollow Mystery series. If you love a good mystery with a hint of thriller to it, this i WOW! This book was full of excitement! I really enjoyed reading this book. Lots of twists and turns and I was forever second-guessing the who-dun-it. The characters were well developed and I was able to picture them in my mind quite easily. I loved that the story took place in a ski resort area, as it added a nice backdrop. Having lived in a ski resort area for a number of years, I was able to relate with the 'residents' very well.